Strength of Character: What Makes a Mobile Game App Truly Fun to Play? 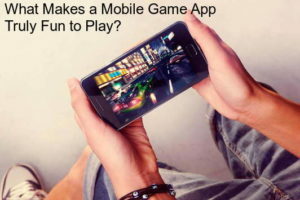 What Makes a Mobile Game App Truly Fun to Play? There are literally hundreds of thousands of mobile games available, but not all of them are fun. You can see a very clear difference between one that is addictive versus one that is boring and dull. It’s not about genre or mechanics, and it’s not even about intended age or title. Let’s go through some of the primary differences between fun and dull games to see why some mobile games succeed and others fail. Every good mobile game has interesting characters and a sense of progression. Many times there are supporting characters and you are the protagonist, but others have heroes that you act through. In either case, the characters should be interesting, engrossing and somehow larger than life. Progression is just as important. You want to feel like you’re getting somewhere. You want to visibly see your character getting stronger or the environment changing as you progress through levels. For example, when your hero in Final Fantasy 15 levels up, you see a big difference as he fights against monsters. There are numerous types of mechanics depending on your game genre. For example, a puzzle game and an RPG won’t have the same mechanics, though there are a few games that mix them together. Your mechanics should be unique and fun, but not overly difficult to understand. The primary aspect you should focus on is ease of use. If players cannot immediately understand how to play the game, then you have failed. Thoughts on difficulty are a little polarizing. Most people believe that mobile games should be on the easier side, but there is a growing movement towards creating mobile games that are challenging. In either case, the game should provide some difficulty to make progression worthwhile. It shouldn’t be too easy or too difficult. This is even more polarizing than difficulty, but it’s easy to find some middle ground between the various opinions. If you look at all of the different games, then you will see many unique art styles. There are some games that use retro pixel art, others use a painterly look that is very artistic and some will use 3D technology to make either realistic or stylized graphics. While all of these styles seem wildly different, they all interact with players on a deep level. All of these styles are attractive and grab players by appealing to their sense of beauty, nostalgia or awe. The graphics should make your game attractive so that players want to continue using the app. Rewards are like incentives. Improper use of them will make you seem desperate, either for attention or money. Other games may seem stingy if they never give out rewards. Proper use though can keep players coming back for more. It can also make the game more enjoyable. For example, most puzzle games will have lives and items that help during each round. A good game will give out daily bonuses, reward players for reaching a certain level and give out items for achievements. This goes along the lines of progression as it makes players feel like they are getting somewhere. People love being rewarded and a good game can make use of this to make players happy. Mobile games are often very fun, but there are a number of bad games out there that receive few downloads. A truly fun game should be reasonably difficult, have amazing graphics, strong characters and a sense of progression with good rewards. If you find a game that follows all of these rules, then you’ll definitely have hours of fun with it.